We found this graphic to illustrate just quickly a bad idea can become a nightmare. 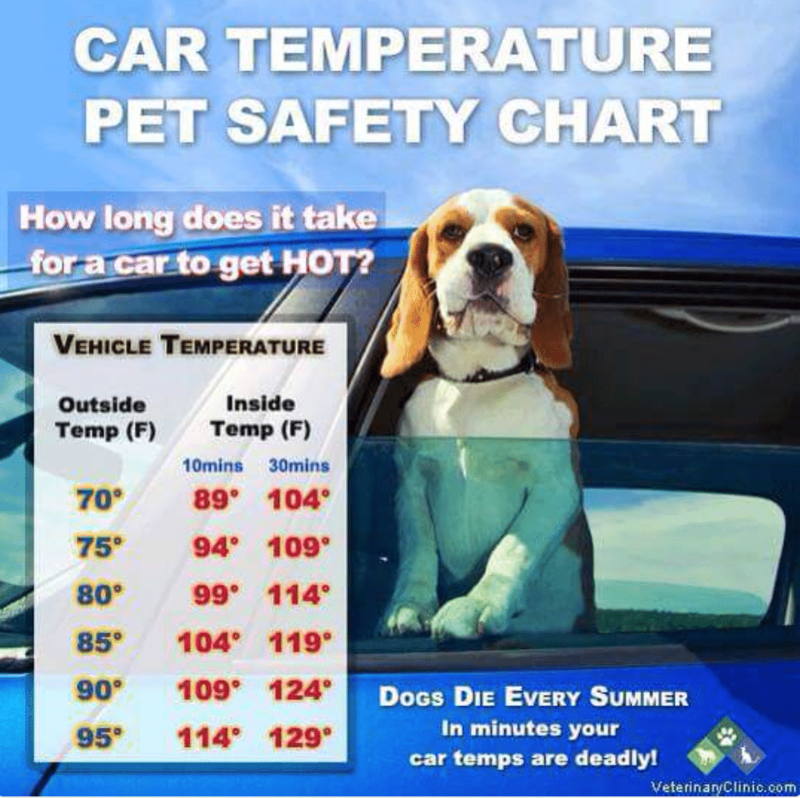 Notice that 10 minutes in a car in 70 degree weather puts a dog in a temperature of 89 degrees. The same time frame with 75 degree weather brings the car to 94 degrees. 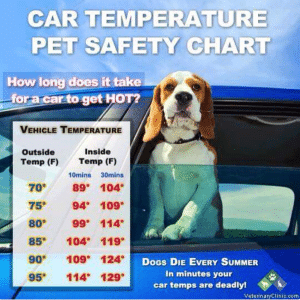 Even on sunny days where the temperatures are in the 60’s, temperatures quickly rise and dogs can be harmed if left in the car. An innocent, quick trip into a convenience store can easily take longer than anticipation for a multitude of reasons. And no one should be fooled into thinking leaving a window cracked open is the answer. Dogs can sustain brain damage or die from heatstroke in just 15 minutes. As they can only cool themselves by panting and sweating through their paw pads, it’s plain to see that weather does not have to be a record-breaking heat wave to cause harm. If you see someone has left a dog in car, you can help. * Take down the car’s make, model and license-plate number. * If there are businesses nearby, notify the managers or security guards and ask them to make an announcement to find the car’s owner. * If the owner can’t be found, call the non-emergency number of the local police or animal control and wait by the car for them to arrive. Did You Know NJ Has Laws for Dogs Left in Cars? A partially opened window is an invitation. In mere seconds, the window can be forced down or smashed and your dog stolen. It takes 20 seconds or less to abduct a dog. Twenty seconds! 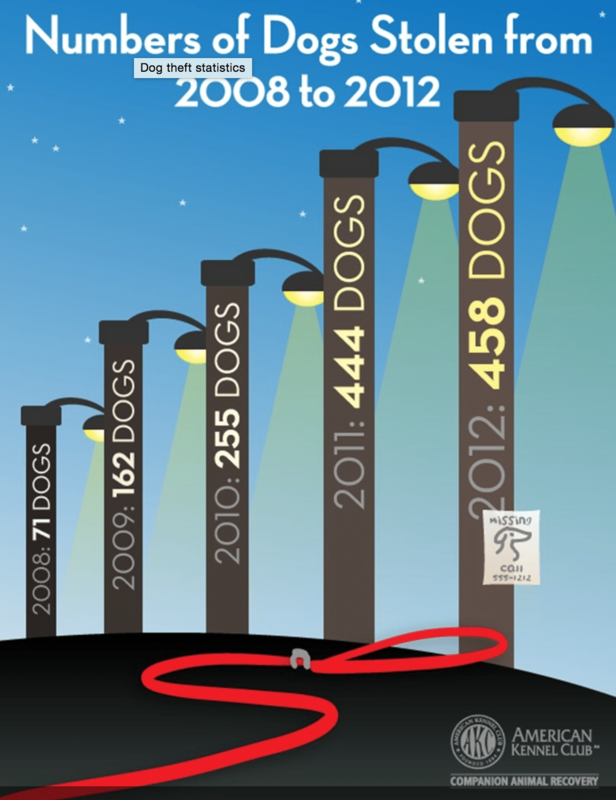 With the rising cost of pedigree dogs, it’s no surprise that some dogs are stolen for resale. Many animal-related organizations and charities are warning that dogs are also taken for use in illegal dog fighting rings, as bait/prey for dog fights, sold to puppy mills for breeding, sold to laboratories or even held for ransom. A family from Glendale, Colorado paid $1,500 dollars to get back their Yorkshire Terrier after he was stolen from their car. 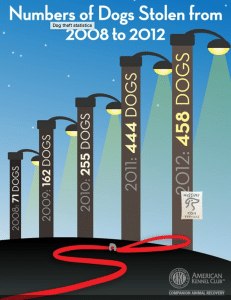 The reality is that given the opportunity, theft occurs amongst all breeds of dogs. The trends in this list cover all dogs – small dogs, designer dogs, fighting dogs and popular family-owned breeds. Fun Facts About Your Dog’s Senses!